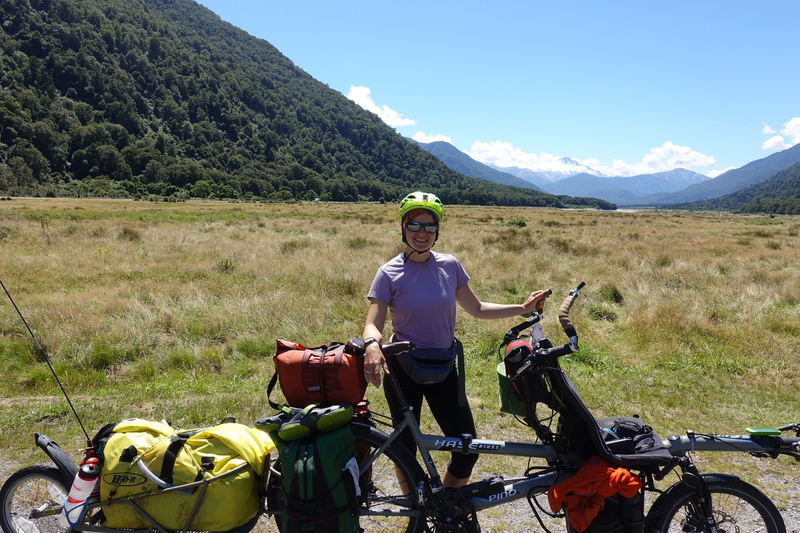 Greetings from Te Anau! Cédric and I are here regrouping after what felt like a few days in the wild. 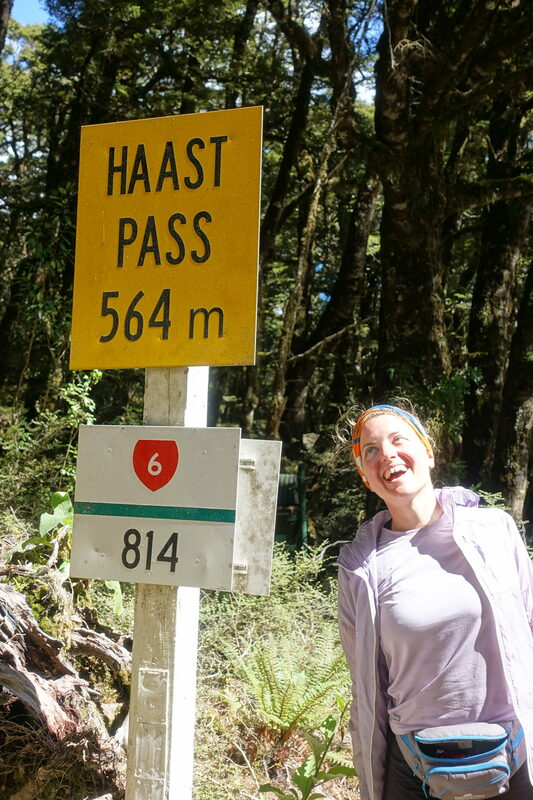 After Cédric and I left the town of Haast on Wednesday the 7th, we started the long journey towards the Haast Pass – not the highest point on our journey, but certainly one of the steepest. 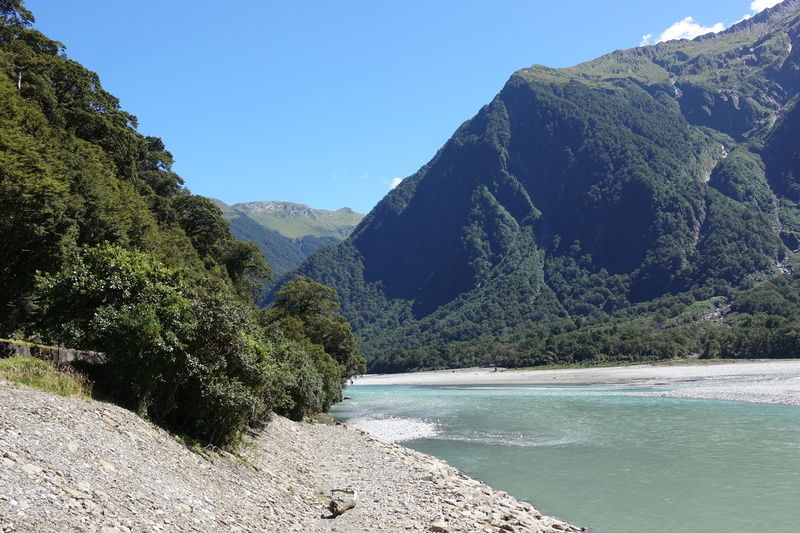 We first needed to cover about 50 kms of an undulating river road before we even began to climb -however, we were enjoying watching the landscape change from lush fern-filled forests into valleys surrounded by glacial peaks. 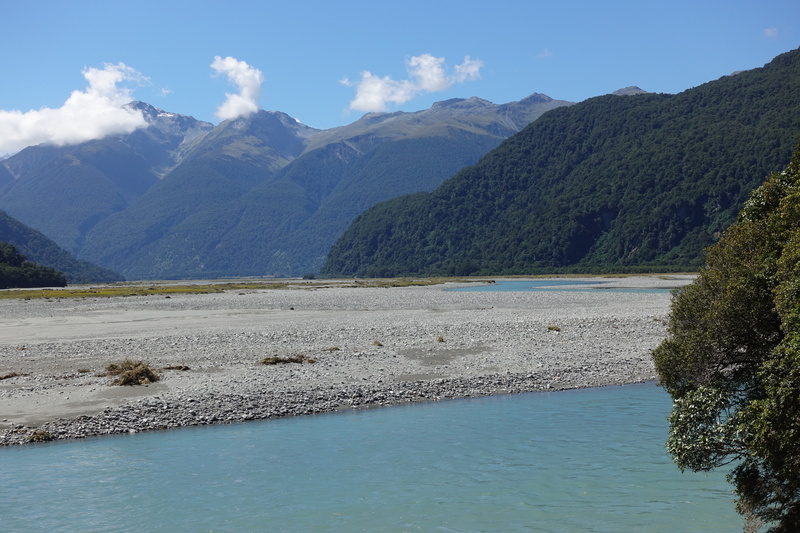 After the 50 kms, we went past the Gates of Haast (river rapids – the name was a discussion/inspiration of a possible heavy metal album during the whole morning… GAAATEEES OFFFF HAAAST!!!) and started a grueling climb in the afternoon sun. It usually gets difficult to climb inclines over 10%, but over pulling over 200kg at 15% (indicated by our Tachometer) becomes a real challenge. But even at 5km/h we seem to struggle about as much as buses and trucks! About an hour later, Cédric and I reached the top (564 m) and were rewarded with an amazing ride into an alpine valley. The night’s sleep at the Cameron Flats campsite was worth the climb because of the jaw-dropping views. Right before we approached the campsite, I remember asking Cédric how we got so lucky to live on a planet like ours. 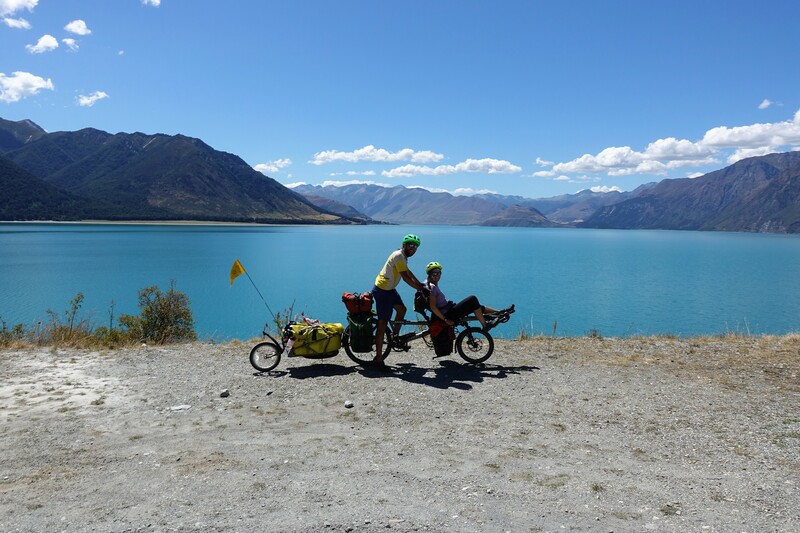 The next day, in full sun, we were rewarded once again as we cycled along Lake Wanaka and Lake Hawea. 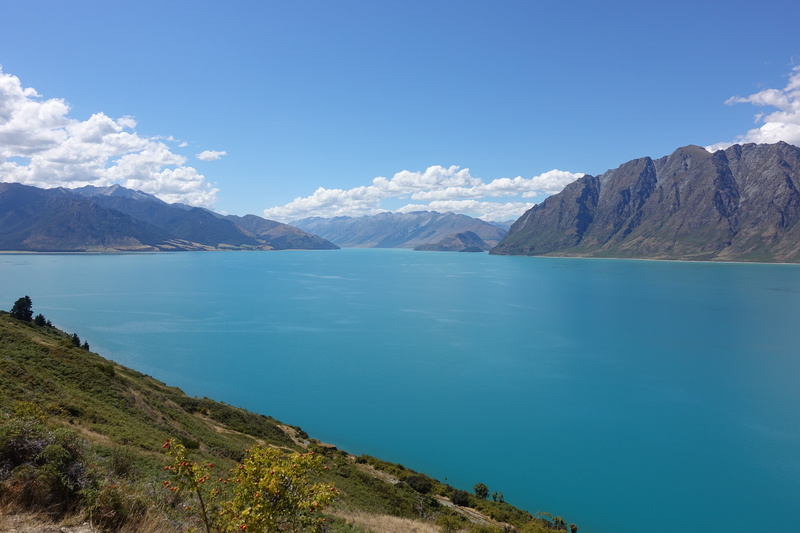 Unlike inland lakes I’ve seen in the States, these were completely uninhabited and turquoise blue. 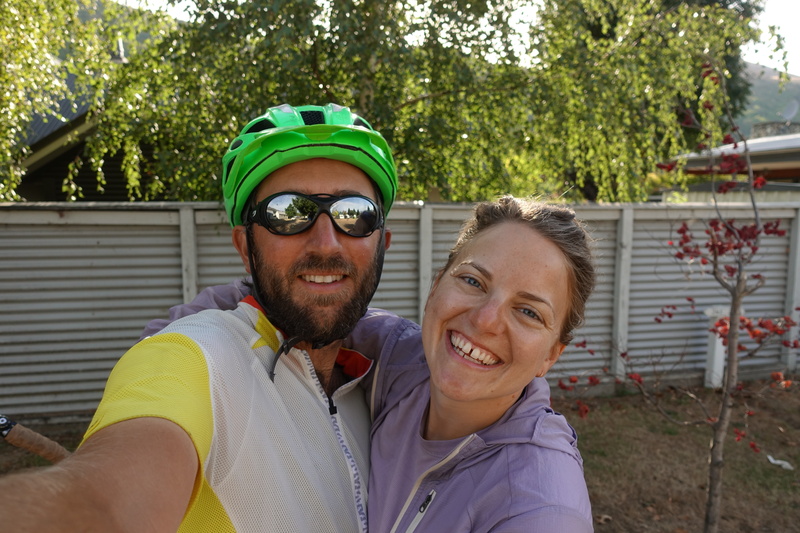 Needless to say, Cédric and I stopped at nearly every roadside pull-off to take dozens of pictures. 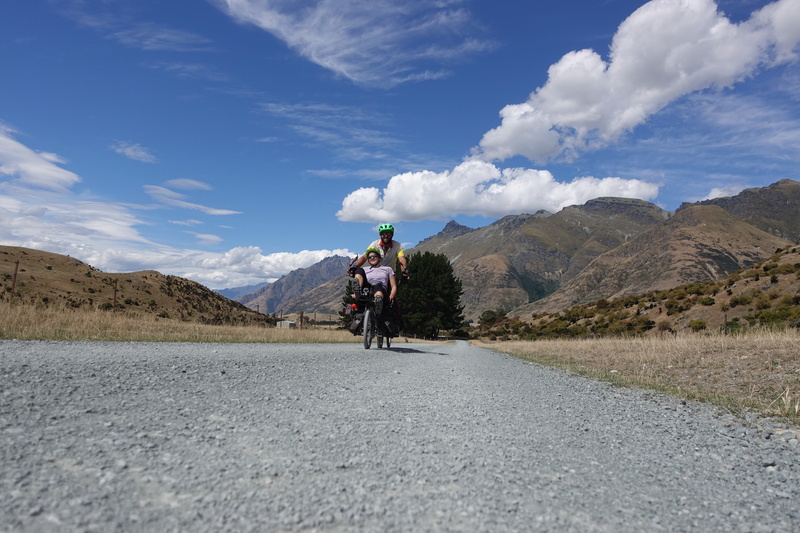 The scenic and serene ride ended abruptly once we rode past Lake Hawea Township and entered the tourism zoo surrounding the cities of Wanaka and Queenstown in Otago. 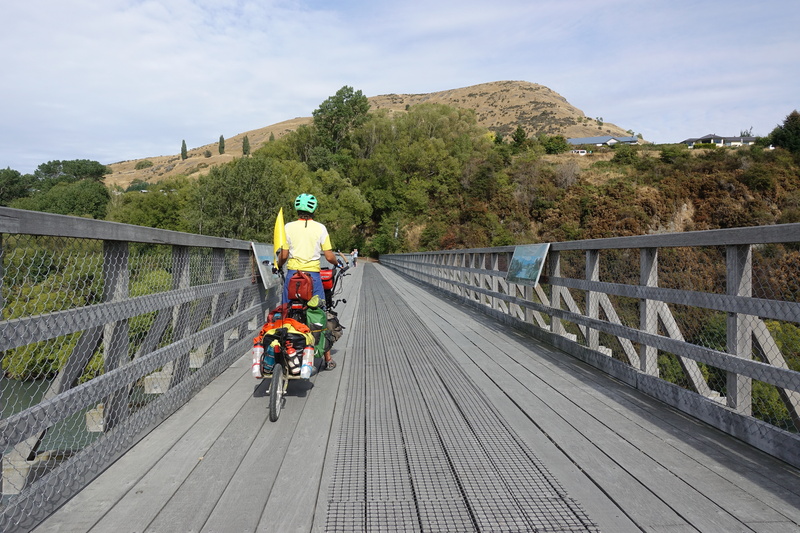 Once again, trucks and cars zoomed past us on the highway as we entered the city of Wanaka. The week before on the West Coast, there was a fair amount of traffic, but as these were mostly rentals, people gave us a generous amount of space to pass. Entering Wanaka we felt overwhelmed from the amount of people, so we made a plan to leave the next morning as quickly as possible. 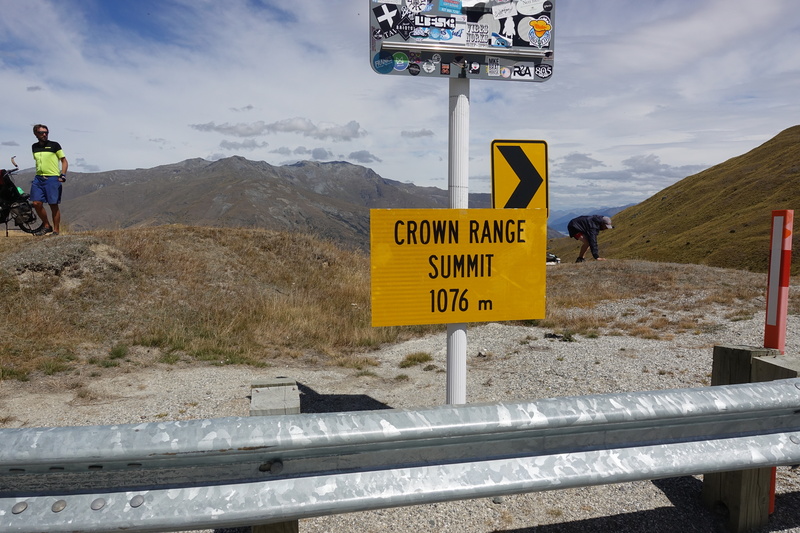 Friday, feeling fit from conquering the Haast Pass, Cédric and I decided to challenge ourselves and try the Cardrona Crown Range – an ascent of over 800 meters, reaching a height of 1070 meters. It was a morning of a gradual uphill ride and the last 300 meters almost pushed us (me particularly) over the edge, but we made it to the top and enjoyed an amazing view onto the valley below. 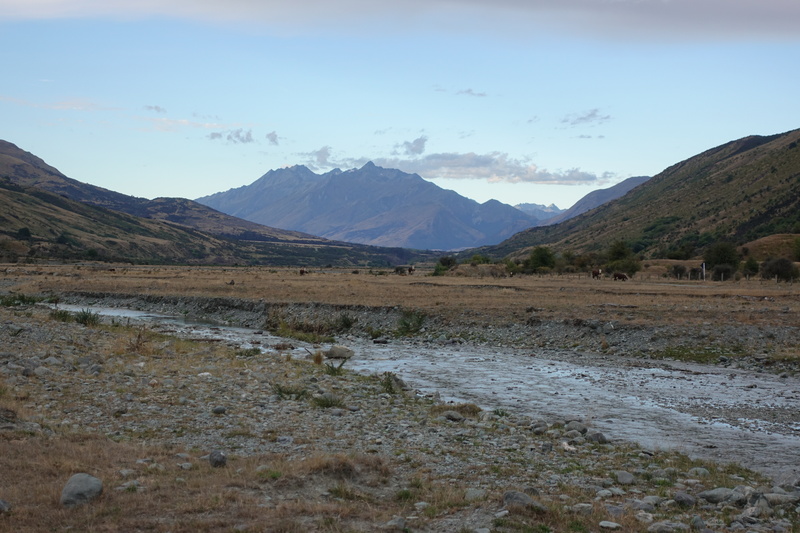 Once finished our lunch at the top, we zipped down to Arrowtown for the night. In the evening, we explored the town and the neat main street that was built in the goldrush era. 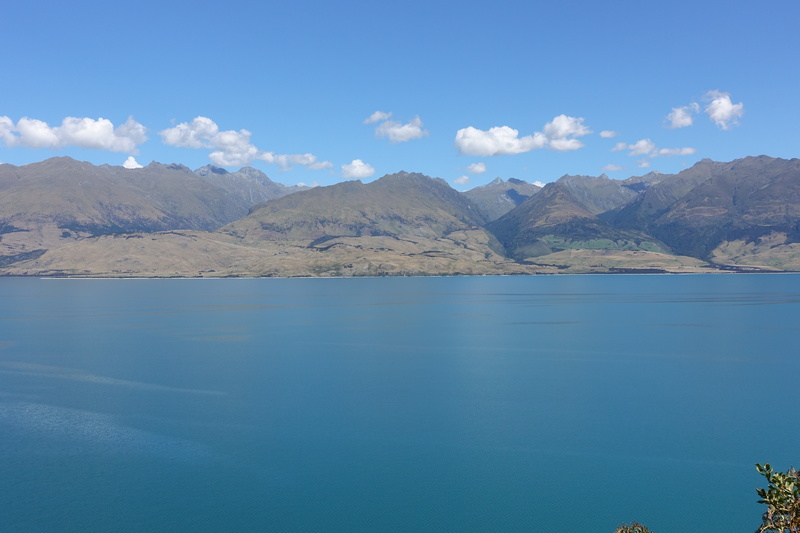 The next morning, Cédric and I made plans to blow through Queenstown as quickly as possible. 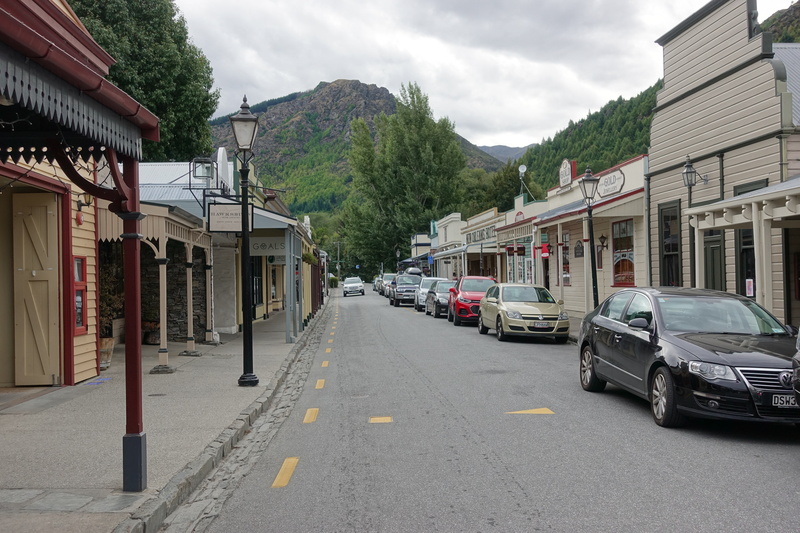 Although Queenstown is the largest tourist city in New Zealand, we found that it didn’t have much to offer besides expensive day tours and obscenely expensive campsites. 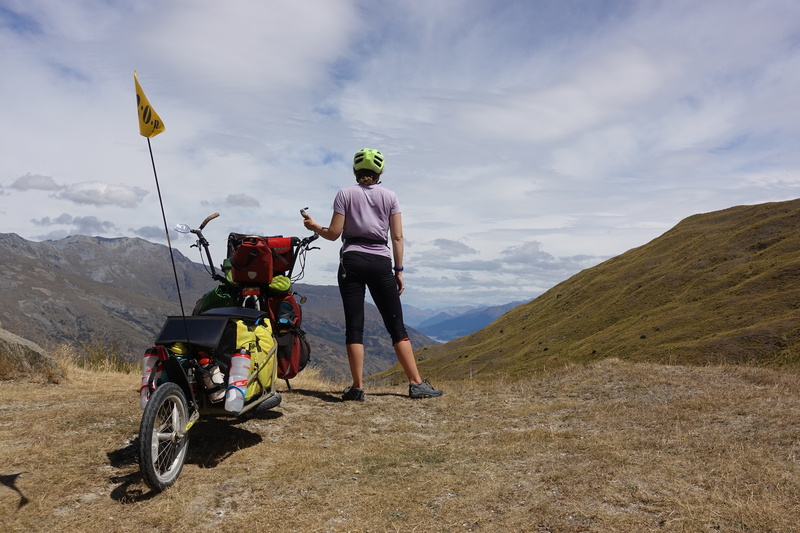 Our morning included a short ride to Frankton to purchase a GoPro (better and easier films – it’s not super easy to hold a normal camera and steer the bike at the same time) and groceries for the next few days in the wilderness. 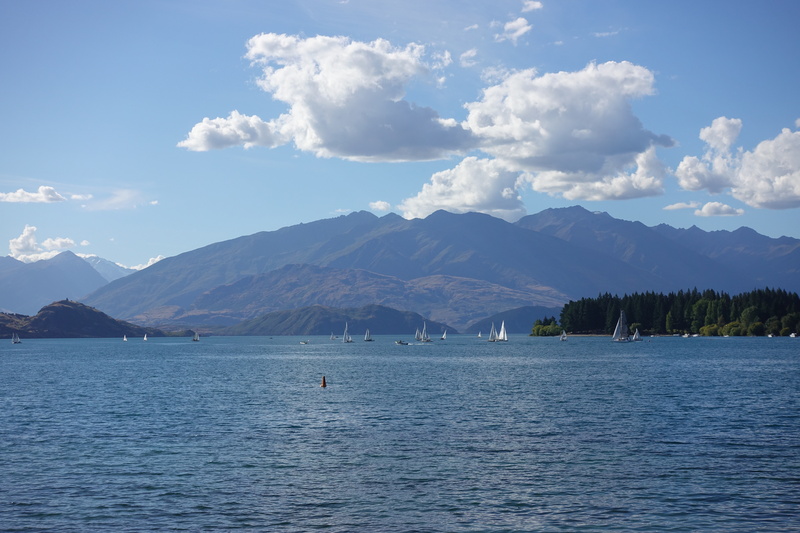 Queenstown just feels like a big “noisy-experiences” location and tourist trap. 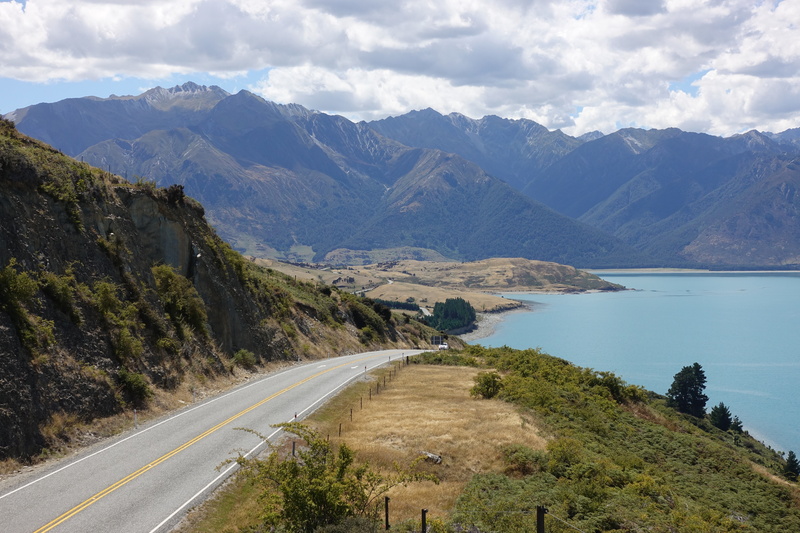 Queenstown is relatively remote and unless you drive 100km, not many alternatives. 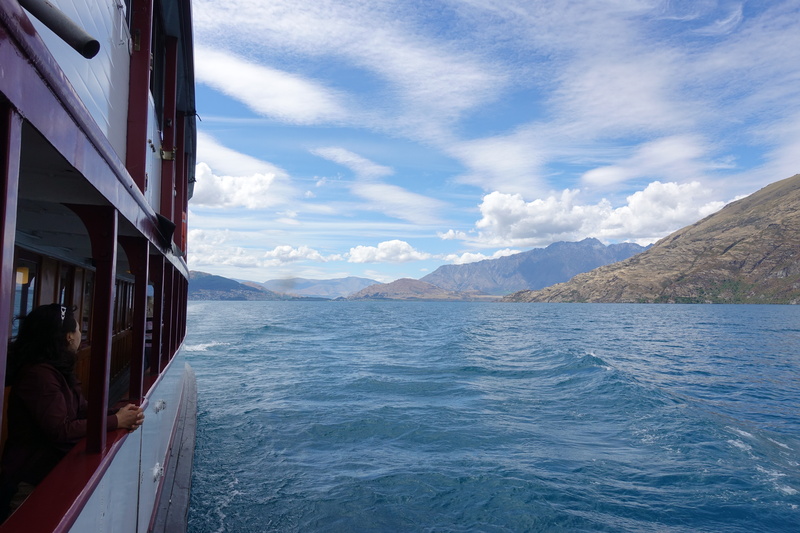 Once there everything tells you to spend money on bungy-jumping, speed-boats, shark-submarine-jet-ski, or any possible invention charging hundreds of NZD for a couple of minutes. 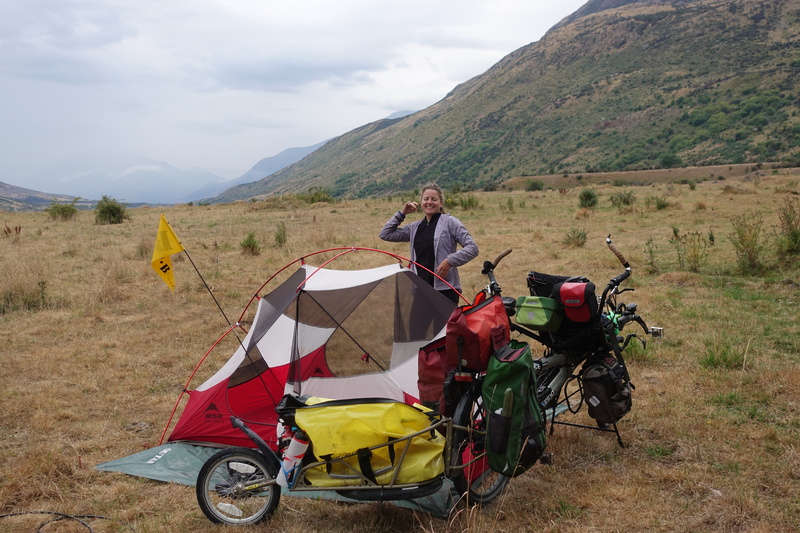 The town has traffic-jams of RVs, motorbikes and buses: needless to say – our stay was very short! 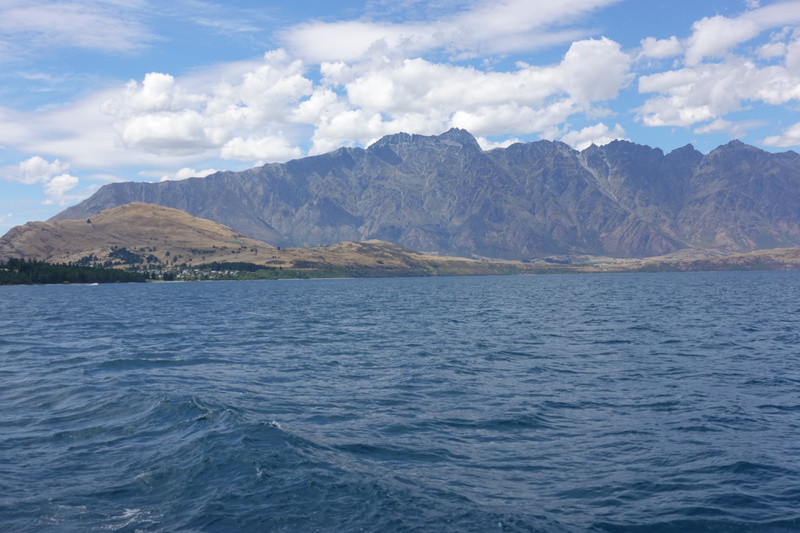 So once we got to Queenstown, we boarded a ferry to Walter Peak, a ranch-turned-bourgeois sheep farm on the other side of the lake. 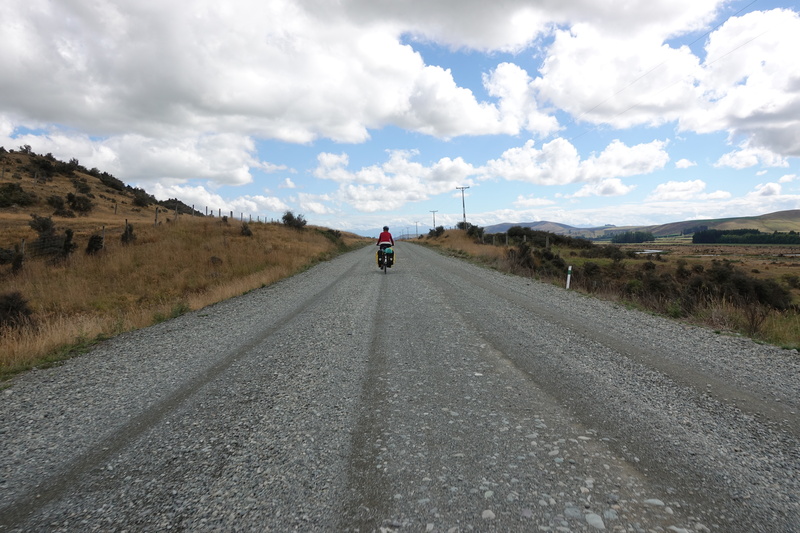 Only 500 meters away from the farm, Cédric and I were thankful to be alone on the road again. We were also welcomed with more amazing views of landscapes without buildings and vacation homes. That night, we were happy to be camping in wild and quiet. Sunday morning, our few days of sunny weather came to an end with rain showers lasting nearly the whole day. That, combined with the gravel roads and uphill climbs, made for a tiring day. 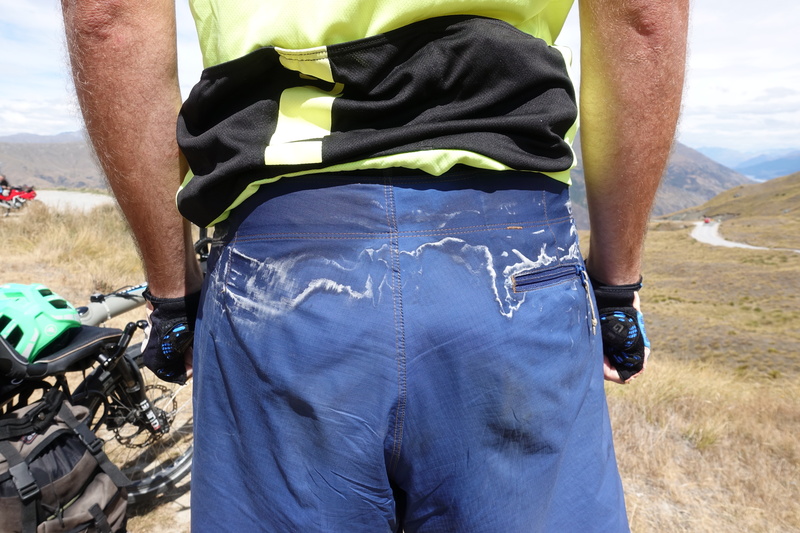 As we were finally approaching the downhill section of our ride, BAM, our rear tire explodes. When we checked it out, both the tube and tire were ruptured – we are on a gravel road 70km from a road, 100km from a town. I guess when it rains, it pours. After we changed our tire (we have spares for a reason), we ate a frigid lunch with our fingers numb from the rain. 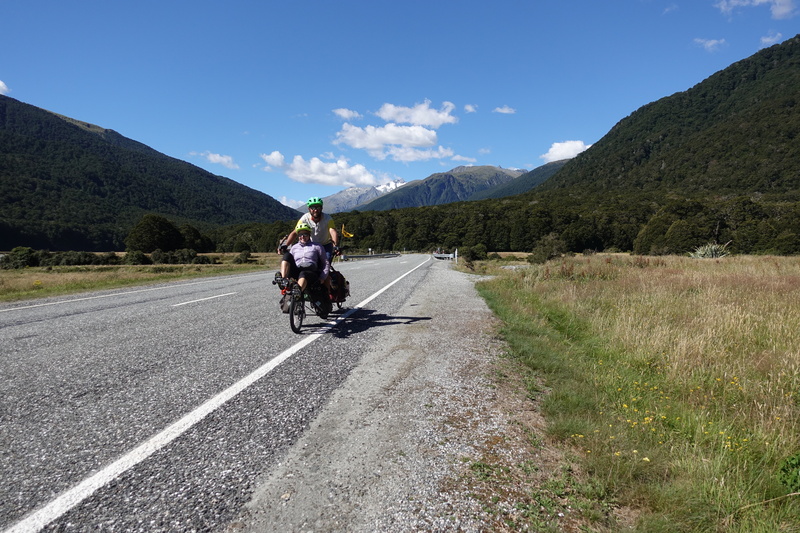 As we rode down the valley, the sun came out and we started to dry off. 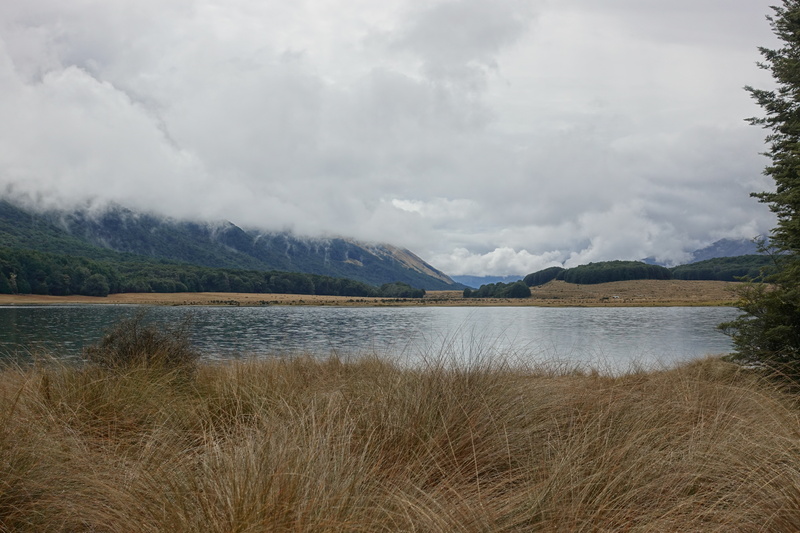 The end of our day was spent looking for a nice spot of land to camp on before Te Anau. The usual campground fee in this region is usually a hefty 20+ NZD per person for the right to pitch our tent on a piece of grass in a noisy campground, and for that price you sometimes don’t even get a shower… Plus you get your neighbors somehow slamming their car doors every few minutes, trying to start a discussion by comparing their motor-bikes with your pedal-bike at 9pm (often our bed time), talking how they drove non-stop from Auckland in 4 days, etc. We prefer the birds singing! There’s probably going to be a few random posts soon about tourism in the south-island… compared with the north island, the South Island has definitely more nature and gorgeous landscapes – however the friendliness and stupidity of people around tourism (both tourists and people making money out of them) seem to follow an reverse and opposite scale. 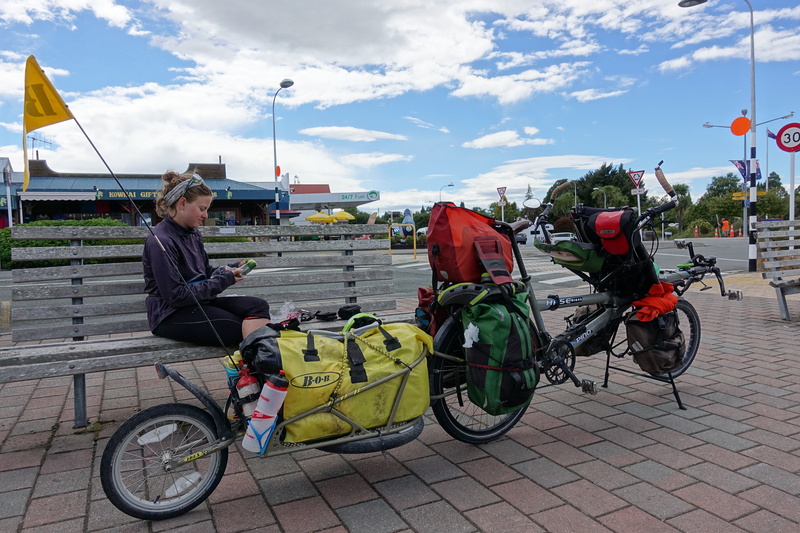 Today, we’re in Te Anau and regrouping before we head off to Milford Sound (with a rental car, a guided tour in a bus is likely to make Cedric grumpy for a week here) tomorrow. The town here is big enough to provide us with a Laundromat (yes Mom, we do clean our clothes), sneak rogue showers at campgrounds, cheap fresh fruits and veggies (no, we do not eat only noodles…) and purchase a new spare tire and tube (we are thinking of taking a few more in the next large city – our last two “good” tires have barely reached the 2000km, so we are not super confident anymore!). 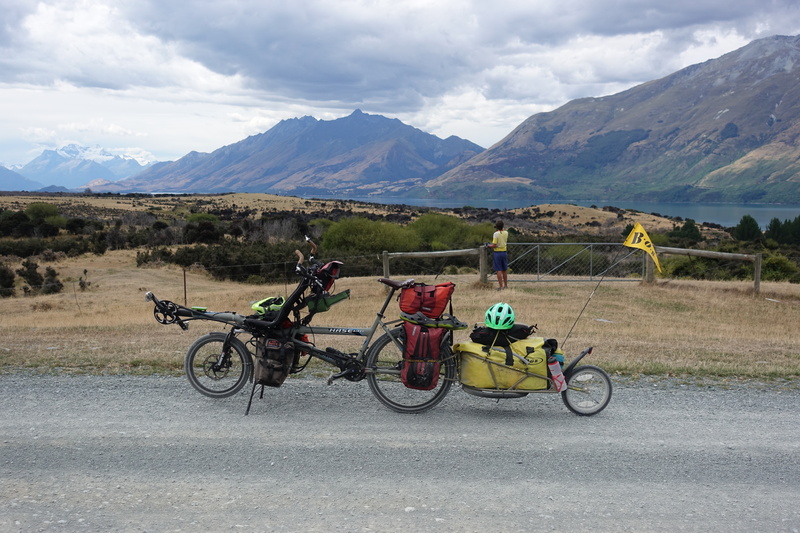 We’ve got a few issues with bike shops around here, it seems that as in lots of places around the world, they are either incompetent (like we have to explain them that there are different types of tyre quality), unhelpful (do not want to order anything special, we got told that 26″ wheels do not exist in NZ anymore…) or simply stick to selling what they have in stock (“my cheap 10$ counterfeit plastic parts are the greatest items you’ll get in the country, and I have 10 in stock!”). We may simply order parts online from the US or Europe and get them shipped a few weeks ahead… unfortunately for local retailers! Really nice pictures. Take care of your tires, especially this one upfront. Not good at all if it explodes in descent. May be think of a solid tire. Cedric, your mum tells you that “Wednesday is the day of lovers in France, offer a nice gift to Cassie!”. Look forward your next adventures. 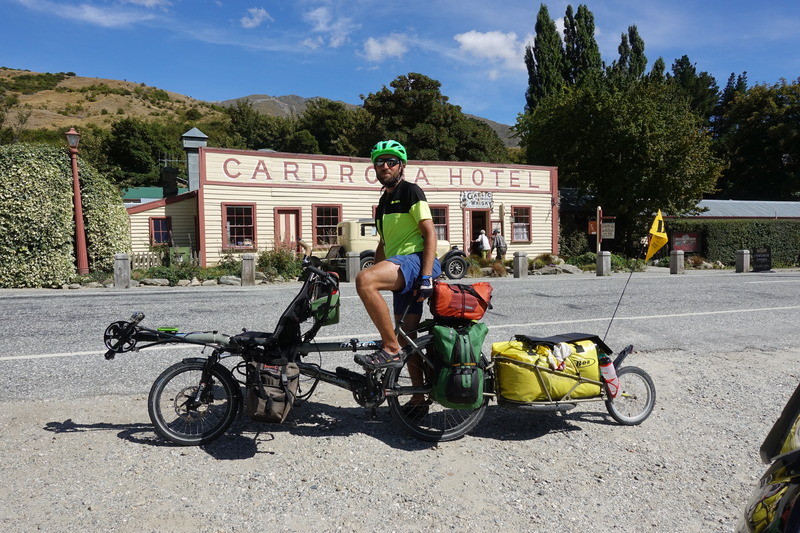 From other users of Pinos, tandems or touring bikes, it’s almost always the rear tyre that gets problems because they support the most weight (me, the panniers, the trailer) – or I might be too obese… – and have to transmit the energy from the chain/hub. 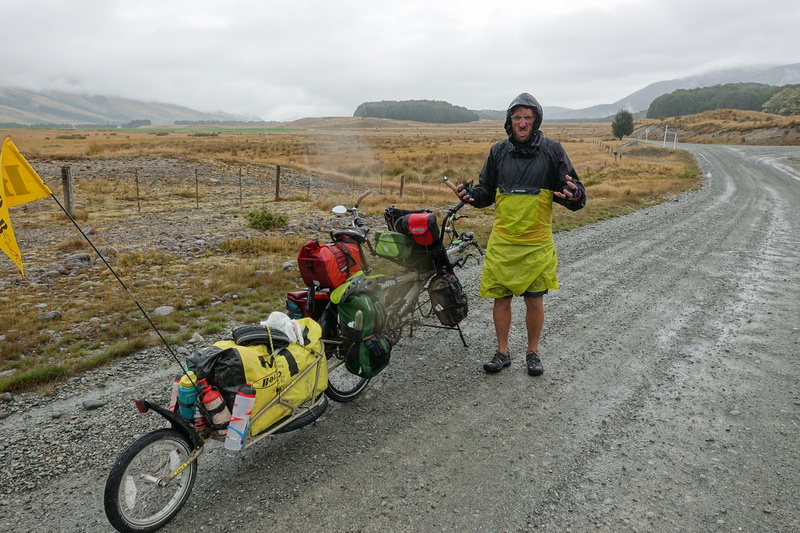 Our front tyre is a 20″, smaller and thus super sturdy – I’ll replace it at 5000km or something (we have a spare and if retailers in Australia are as bad as here, I’ll purchase them in the US or Europe with express shipping).